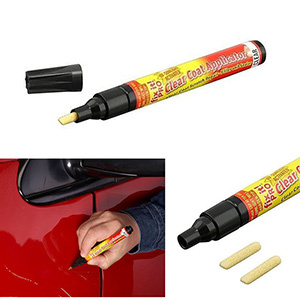 Fix It Scratch Remover is safe to use on any color car to quickly and easily repair scratches and nicks. The secret behind the magic of Fix It is its fast action formula with millions of microscopic polishing agents, which penetrate the scratch and restore the paint of your car to its original shine. Just apply Fix It to the scratch, use the Power Buffer to rub Fix It deep into the surface of the scratch and then wipe it away. With Fix It, the scratch has met its match! Order now and receive the Simoniz Fix It scratch remover. I had a 2 inch scratch in the black paint on my driver's door. It was through to the primer. One stroke of the pen and it blended in very nicely. It is best if you use a silicone/wax removing liquid around the scratch first, so to ensure you are not putting the Fix It Pro liquid on top of wax. Also, the pen tip will harden after a few days after its initial use, so be sure to cover all the scratches on your car when you open the pen. They give you one spare tip, so you can do about two separate applications with this if you do it, say, a week or month later.